Jamison Clouthier ’08. Kaleb Hart ’11 photo. Jamison Clouthier ’08 manages cloud sales and strategy for the Northeast at Hewlett-Packard (HP). An award-winning sales representative, Clouthier works with clients, partners, and HP account teams to strategize how building a cloud model in their own environment can help businesses innovate, reduce costs, and create a competitive advantage. 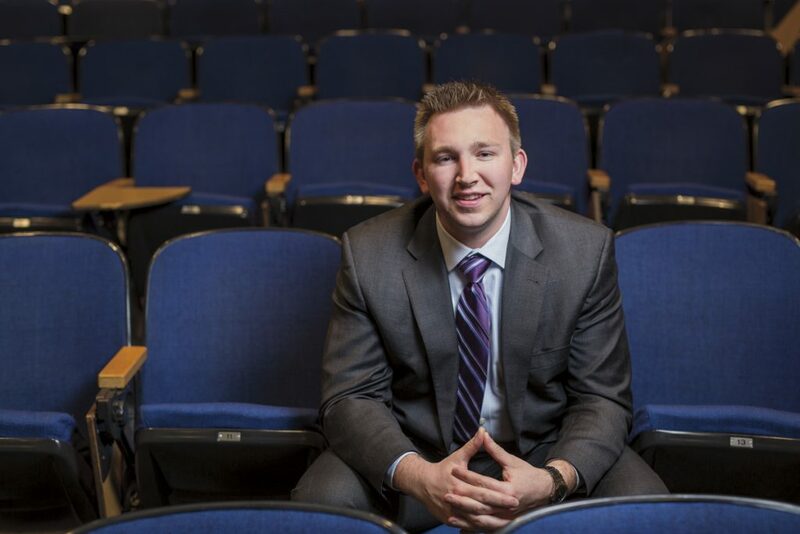 Plymouth Magazine talked with Clouthier about his remarkable career trajectory in the short time since he graduated from PSU. How did you come to your career choice? I never would have thought my career would be in sales. When I was little, I wanted to create commercials and be a professional athlete. In college I was interested in marketing, economics, and finance, putting a pure focus on business. It wasn’t until my final year at PSU that I took a professional sales course and realized I had an interest in the subject. I ended up representing PSU at the National Collegiate Sales Competition in Georgia and, amazingly, walked away with nine job offers; I selected Hewlett–Packard based on industry reputation, corporate culture, training, and, most importantly, opportunities for advancement. You’ve been recognized as a high performer (in the top 1 percent) at HP, a company with more than 300,000 employees, and have held multiple roles with increasing levels of responsibility since starting in 2008. What motivates you? I love what I do and am 110 percent motivated by our ability to help clients exceed their goals. It’s gratifying when a project you work on comes to fruition and is market changing for that client. It sounds like you’re “on” all the time. What’s your favorite way to unwind? My favorite place on Earth is the Lakes Region. There’s nothing like spending the week on the lake relaxing, enjoying the views of the area, and tubing and wakeboarding. As part of a generation that prioritizes flexibility and autonomy, what benefits have you experienced from making a long-term commitment to one employer? I’ve been fortunate to work for a great company like HP and have built strong relationships both inside and outside of the company. Over the last seven years, I’ve experienced the best of times and times of turbulence. I’ve learned how to navigate adversity and varying economic conditions. Every role I’ve held has challenged me in different ways, enabling me to continuously learn and work on advancing my professional skillset. Describe your work on PSU’s Sales Advisory and NH Jobs for America’s Graduates (JAG) boards. How have you grown through your experiences with each organization? I look at both of these organizations as a way for me to give back. With NH JAG, we aim to prevent high school students from dropping out by creating positive change through education, leadership, training, and career-building programs. With the PSU Sales Advisory Board, we make sure the program is preparing today’s students for tomorrow’s jobs. We want to help students build a solid foundation they can carry into the real world, regardless of position or industry. Serving on both boards has given me the chance to meet intelligent, talented students and to work alongside some influential and successful professionals. It’s helped me gain a different perspective on the world, motivating me even further to help wherever I can to positively influence young adults. Why is networking important in business, especially in areas such as sales? Many of the people in your network will not just be contacts, but friends, sometimes for life. Networking helps you learn the dynamics of your industry from trusted contacts, accelerates your professional development and advancement, and creates connections. Whether you have questions about an industry, are seeking a new position, or are facing a challenge or obstacle, relationships are the catalyst for success. I have put a lot of focus on building my network by helping others. I take the “pay it forward” approach. Without the power of a network, I never would have met many of the good friends I have today. It’s a hard read, but I’ve gotten a lot out of The Intelligent Investor by Benjamin Graham.